White light split by a prism. The additive primary colors are clearly visible. A simulated example of additive color mixing. Additive primaries act as sources of light. The standard red, green, and blue combine pairwise to produce the additive secondaries cyan, magenta, and yellow. Combining all three primaries (center) produces yellow and white. The additive mixing of colors is not commonly taught to children, as it does not correspond to the mixing of physical substances (such as paint) which would correspond to subtractive mixing. For instance, one can additively mix yellow and blue by shining yellow light together with blue light, which will result in not green but a white light. As in this example, one should always have the mixture of light in mind when considering additive color mixing as it is the only situation where it occurs. Two beams of light that are superimposed correspond to additive mixing. By convention, the three primary colors in additive mixing are red, green, and blue. In the absence of color, when no colors are showing, the result is black. If all three primary colors are showing, the result is white. When red and green combine, the result is yellow. When red and blue combine, the result is magenta. When blue and green combine, the result is cyan. Additive mixing is used in television and computer monitors to produce a wide range of colors using only three primary colors. A pixel is a juxtaposition of these three primary colors. Projection televisions typically have three projectors, one for each primary color. A simulated example of (idealized) subtractive color mixing. An external source of illumination is assumed, and each primary attenuates (absorbs) some of that light. The standard subtractive primaries cyan, magenta, and yellow combine pairwise to make subtractive secondaries red, green, and blue (which themselves are additive primaries, or in practice somewhat darker and less-saturated versions of typical additive primaries). Combining all three primaries (center) absorbs all the light, resulting in black. For real pigments, the results would be somewhat complicated by opacity and mixing behavior, and in practice adding a fourth pigment such as black may be helpful. The mixing of colored physical substances corresponds to subtractive color mixing, hence it corresponds to our intuition about mixing colors. To explain the mechanism, let us consider mixing red paint with yellow paint. The red paint is red because when the ambient light strikes it, the composition of the material is such that it absorbs all other colors in the visible spectrum except for red. The red light, not being absorbed, reflects off the paint and is what we see. This name mechanism describes the color of material objects -- note that light is not a material object -- and so applies to the yellow paint as well. Making recourse to the figure above demonstrating additive color mixing, one sees that yellow light is composed of an (additive) mixture of red and green light. When we mix the two paints, the resulting substance has red paint and yellow paint. The yellow paint absorbs all colors except for red and green. However, the red paint will absorb the green reflected by the yellow paint. The red paint can be said to subtract the green from the yellow paint. The resulting paint reflects only red light and so appears red to our eyes. Note however that this description is theoretical and that the mixing of pigments does not correspond to ideal subtractive color mixing because some light from the subtracted color is still being reflected by one component of the original paint. This results in a darker and desaturated color compared to the color that would be achieved with ideal filters. 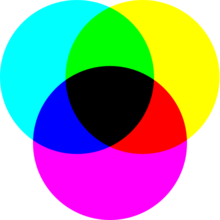 The three primary colors in subtractive mixing that produce the largest gamut are yellow, magenta and cyan, leading to the CMYK color model widely used in color printing. Historically, painters have used yellow, red and blue in place of these, resulting in reduced gamut. In subtractive mixing of color, the absence of color is white and the presence of all three primary colors is black. The secondary colors are the same as the primary colors from additive mixing, and vice versa. This is not an accident. By mixing additive secondary colors subtractively one can reachieve the primary additive colors. Subtractive mixing is used to create a variety of colors when printing on paper by combining a small number of ink colors, and also when painting. Red is created by mixing magenta and yellow (removing green and blue). Green is created by mixing cyan and yellow (removing red and blue respectively). Blue is created by mixing cyan and magenta (removing red and green). Black can be approximated by mixing cyan, magenta, and yellow, although real pigments are not ideal and so pure black is nearly impossible to achieve. Macaulay, David and Neil Ardley (1988). The New Way Things Work. London: Dorling Kindersley Ltd. ISBN 0-395-93847-3. This page was last edited on 11 April 2019, at 22:12 (UTC).